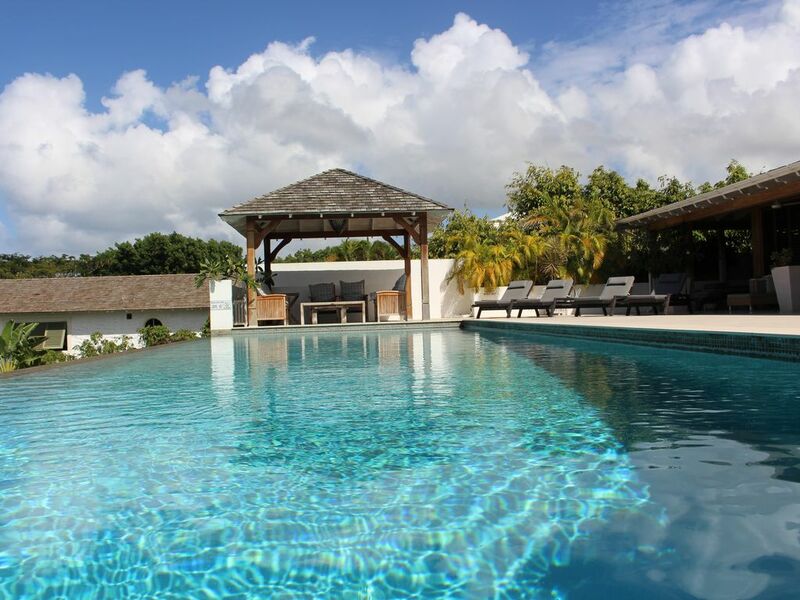 Luxurious Balinese inspired villa in a tropical modern style with an open plan layout, situated within the small private gated community of Calijanda, adjoining Royal Westmoreland and Sugar Hill and within a 5 minutes drive to the local beaches and Holetown. The villa has 4 double bedrooms with en suite bathrooms, 1 single bedrooms and 2 further shower rooms. A stunning 15m infinity edge pool with dining gazebo. Fully equipped kitchen for your every need with gas BBQ. Maidlaundress service and cook by arrangement. Free wifi. UK family owned villa with friendly English house manager to look after you during your stay. The villa was built for the owners in 2005, designed London architect, Harper Downie, to a modern tropical Balinese design. The property offers luxurious living and generous proportions with cool Portuguese limestone finishes throughout. Spacious, airy open plan living to accommodate 4 couples or two families in great comfort. Fantastic 180 degree sea views. Private 15m infinity edge pool with large terrace. Total privacy and security. Private gated community and gated villa. Easy access to beaches and local town - 5 minutes drive. Friendly and discreet staff. Flexible arrangements for length of stay and check in/out times to suit guests. En suite master bathroom, outside bath tub on private terrace with sea view. 4 further bath/shower rooms, 2 en-suite. Large open plan sitting room with seating for 10 persons overlooking the pool deck. 3 dining areas - including formal dining in main reception hall, kitchen and breakfast bar on pool deck. Fully fitted bespoke kitchen with all machines, breakfast bar and breakfast table. Several dining areas to seat 8 persons+ including the treehouse which comprises dining and sitting areas, formal dining table for 8-10 persons in the villa, and a breakfast bar on the pool deck. Golf courses at Royal Westmoreland - 1 minute, Sandy Lane - 10 minutes, Barbados Gold Club - 30 minutes. Ground floor - on one level and suitable for those with limited mobility. Notes on accommodation: Ground floor - Spacious, airy double height open plan living with dining/sitting areas and kitchen, leading onto the pool deck. 2 double bedrooms and 2 single bedrooms (one single is small and suitable for a child) and 3 bathrooms. 1st floor - 2 double/twin bedrooms with en-suite bathrooms. Outside: Private in-out driveway with 2 electric remote control gates with parking for 4 cars. Dining and seating areas on pool deck. Large private 15m infinity edge pool. Private garden with lush tropical planting. 180 degree views of the west coast of Barbados. Utility Room: Utility room off kitchen with 2nd fridge/freezer, microwave, washing machine and tumble dryer. Cleaning / Towels / Linen / Maid service: Maid/laundress 6 days per week included - 8am - 3pm. Linen and towels changed 3 times per week. Swimming towels available daily. Other: Sitting area with flat screen TV, DVD. Shaded gazebo to seat 10 persons on pool deck. Water skiing, deep sea fishing, scuba diving, snorkelling, swimming with turtles and tropical fish. Tennis, horse riding, hiking. 5 minutes drive to beaches on west coast - Holetown. Grantley Adams airport - 30-40 minutes by car. Car hire available from airport and necessary, or taxi from airport and a car can be delivered to the villa. Holetown - 5-10 minutes drive - shops, restaurants, beaches and local amenities. Speightstown - 15 minutes drive - shops, restaurants, beaches and amenities. Holetown will provide all that is required from a super market, several banks, gas station, shops, restaurants, beaches and more. Booking Notes: Book on line with a 25% deposit payable and the balance payable 60 days prior to departure. Changeover Day: Flexible.